4 Real Ales from small breweries on and the 3 that I tried were in excellent nick. Great for a quiet pint during the day but becomes a " different beast " on a Saturday night ! Sunday Roasts looked very good ... not tried because of the imminent departure of the train back to London. The last of my 4 pub ticks before the game in Swansea the other week. This is very much like 2 bars in 1. 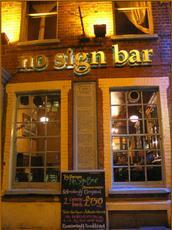 It used to be called Mundays and is now called No Sign Bar. The front bar is a very trendy wine bar type of place, it’s light and welcoming and has 4 pumps with a good choice of ales and flavours, I went for a pint of Three Tuns - Rantipole - 3.6%. It was very good & I especially enjoyed using my camra card for a 10% discount on my pint. Busy but I managed to find a seat close to the bar and chill out. There’s a large choice of wines and spirits as well as the pumps offering ales and decent lagers. A large amount of beer pump clips on display, obviously ales that have been previously served and some of them are cracking, these are ones I have first hand knowledge of. The back bar is more like a chain type pub but I understand this is a new addition. All in all this is a great little place and very different to the other bars in Wind Street. The best of the 4 pubs I visited but this and the Westbourne was head and shoulders the best ones. One of the better pubs in Swansea. Long and narrow. Not a wine bar at all. Decent ales on, i had Mumbles Lifesaver and Hop back Crop Circle. Both at £3.20, but come down to £2.88 with CAMRA discount. Reasonable enough if a little pretentious - it is on the Wind Street Battlezone after all (a street which has a couple of police riot vans patrolling even on a quiet Wednesday night). Staff friendly enough and the ale was good. Like the last days of Pompeii outside on a Saturday night, but great inside. Bills itself as a winebar, but serves a good pint of Reverend James and something with a Welsh name that I can't remember. Best pub we found in Swansea.